Urumqi, the capital of Xinjiang, is proud of it's claim to be the furthest city in the world from an ocean. The drive to the beach is no less than 2250 km! Urumqi is the gateway to the largest province in China, the Xinjiang Uyghur Autonomous Region, a massive geopoliticaly strategic area four times the size of Japan. The region may be considered very remote by us in Australia and New Zealand, but in the past the region was a major transit point on the Silk Road, with a series of fabled oasis's that welcomed traders traveling between Europe and East Asia. The province is home to some of China's most spectacular scenery offering vast deserts and arid plains which are contrasted by large regions of thick forest in the north. Television took some time to reach remote Xinjiang. It wasn't until the 1970's that the first television service for the province was established. Initially programing was restricted to relays of China Central Television programs, it was in the late 1980's that local provincial level programing commenced. Throughout the 80's and the majority of the 1990's Xinjiang television divided the signal channel into programing blocks presented in the three major languages spoken in the region, Chinese, Uygur and Khazak. On August 28th, 1997, the digital satellite television revolution reached Urumqi. Utilising the now retired Apstar 1A satellite, Xinjiang Television established dedicated Uygur, Chinese, and Khazak language channels. Xinjiang broadcasts three free-to-air satellite television channels on Apstar VI. The Chinese language channel presents programing for the regions Han Chinese population who form a majority in the northern area of Xinjiang. The Han Chinese are often viewed as invaders and the relationship between the Han and the Uyghurs (the traditional people of the region) has been strained for many decades. The XJTV-1 channel demonstrates it's links to Beijing by displaying all on screen times in the Beijing time zone that officially covers the whole of China. 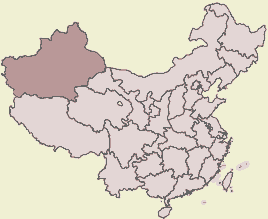 Xinjiang located to the north of India and Pakistan would more naturally fall several time zones to the West of Beijing. XJTV-2 and XJTV-3 both display times in unofficial "Xinjiang Time" which is two hours behind Beijing. Programing highlights on XJTV-1 include the Xinjiang local news at 11 PM and 10 AM Australian Eastern Standard (Sydney) Time. The daily Xinjiang air quality report is presented at 25 minutes past midnight Australian Eastern Standard Time. Daytime programing is predominately Chinese serials and dramas. On Friday nights (Midnight Saturday morning Sydney time) Xinjiang Story a program featuring regional documentaries can be seen. UJTV-1 broadcasts for around 20 hours each day. The channel opens for it's daily broadcast at 9:00 AM Australian Eastern Standard Time. The Uygur language channel presents programing for Xinjiang's largest non Han population. When the province was designated an autonomous region in 1955 the Uygur accounted for 90% of the population. This dominant percentage has been reduced in recent times as Han Chinese have migrated into the province. The Muslim Uyghurs are a Central Asian race who are predominantly settled in the southern fertile oases on the ancient Silk Road. Programing highlights on XJTV-2 include the exotic advertisements for Uyghur food and sweets. The local news in Uygur can be seen daily at 10 AM and 11 PM Australian Eastern Standard Time. Daytime programing is predominately serials and dramas. UJTV-2 broadcasts for around 18 hours each day. The channel opens for it's daily broadcast at 9:58 AM Australian Eastern Standard Time. The Khazak language channel presents programing for Xinjiang's Khazak population. The Kazakhs are Muslim nomadic pastoralists concentrated in the north of the province. The land of the Khazak's is largely unspoilt with thick evergreen forests and fast running rivers. The local news in Khazak can be seen daily at 10:45 AM and 11 PM Australian Eastern Standard Time. Daytime programing is predominately serials and dramas. UJTV-3 broadcasts for around 18 hours each day. The channel opens for it's daily broadcast at 9:58 AM Australian Eastern Standard Time. Various Chinese provincial channels are featured in the MediaExplorer package on DVD Disk Two. Since 2004, Xinjiang Television has presented daily regional news in English on the Uygur, Chinese, and Khazak television channels. XJTV English News initially directed to visitors to Xinjiang, has found that the twice daily ten minute bulletins have become popular with the local youth who are eager to embrace English as a second or third language. For us in Australia and New Zealand the programs offer a fascinating insight into Xinjiang's Uygur, Khazak and Chinese culture with extensive coverage of current events, festivals and daily activities. XJTV-1 the Chinese Language Channel presents the regional news in English twice daily at around 7 AM Beijing time (9 AM Australian Eastern Standard Time) and around half past midnight Beijing time (2:30 AM Australian Eastern Standard Time). XJTV-2 the Uygur Language Channel presents the regional news in English twice daily at around 7:05 AM Xinjiang time (11:05 AM Australian Eastern Standard Time) and around 10:30 PM Xinjiang time (2:30 AM Australian Eastern Standard Time). XJTV-3 the Khazak Language Channel presents the regional news in English twice daily at around 6 AM Xinjiang time (10 AM Australian Eastern Standard Time) and around 9:55 PM Xinjiang time (1:55 AM Australian Eastern Standard Time). Three language services of Xinjiang Peoples Radio are available on the right stereo audio of the Xinjiang television channels. Xinjiang Peoples Radio Uygur Service is streamed on the right hand audio of JXTV-2. Xinjiang Peoples Radio Khazak Service is streamed on the right hand audio of JXTV-3.